The specific details of Arya and Bran’s stories in Game of Thrones differ, of course, but I feel that they’re both on similar paths. They’re both on a wizard’s apprentice narrative journey. You know, like Harry Potter. Okay, not exactly like the Boy Who Lived. Bran is kind of a “boy who lived” since Ser Jaime expected that the fall would kill the little sneaker. And Cersei will probably be super-surprised if she ever encounters a grim and presumed-dead Arya Stark armed with the slim rapier Needle. Scene: Cersei’s bedchamber. Lightning outside illuminates Arya Stark at the window. Cersei: Arya Stark! But you’re dead. Because Arya is the girl everyone thinks is dead… but she’s really the girl who lived… yes, I shouldn’t explain my jokes. Let’s pretend this never happened. Like Harry had an ally in the giantish Hagrid, both Bran and Arya have had the assistance of big dudes with names that start with ‘H’. Starts with ‘H’? You know my name’s Sandor, right? Not “Hound”? Ease up, Clegane. 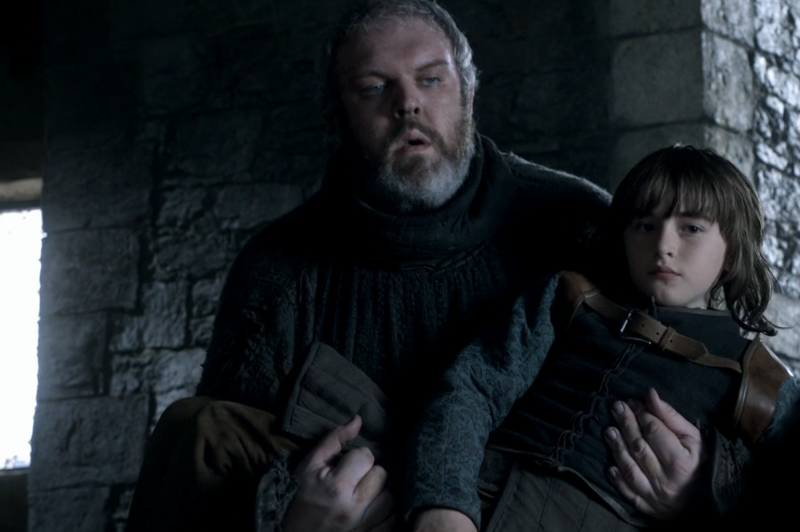 Hodor’s real name is Walder, so his name doesn’t start with an ‘H’ either. Let me have this. The Stark siblings might not have gotten their invitations delivered to them by magical owls, or even via the Westeros equivalent Raven Network, but they both received a form of invitation to come and train in their respective specialities. Bran got his from a dream-invading three-eyed raven, and Arya got her introduction from a Faceless Man assassin. 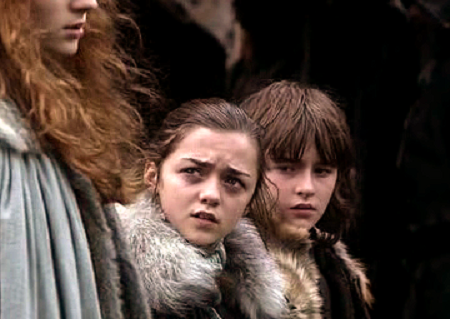 It took them some time (there are no trains running in Westeros or through a tunnel to Braavos) but Bran and Arya both eventually showed up at their respective places that had promised to train them in magic. In the fifth season, we didn’t get to see any of Bran’s training in the Cave of Skulls at the foot of the Old Guy Sitting in Some Roots. So no explicit insights into what magics he’s being trained in. But we do know that there are House Elves around. You know we can set you on fire, right? I mean, the Children of the Forest. Not House Elves. Totally not. Even without seeing what Bran’s studies were entailing, he’d been doing a lot of magical stuff on his own and had received tutoring sessions by fellow minor wizard Jojen Reed, we can make some speculations about what he might be studying. We saw Arya’s training at the House of Black and White. It’s assassination training, which might not seem overtly magical. But it’s magic. There’s magic there. They can change their faces. That’s some cool wizardly stuff, so I’m treating it like a Hogwarts run by Death Eaters. They’re just cooler than House Slytherin though. Fine. She also had to do a lot of sweeping up. Which is only magical if we consider Mickey Mouse animating a broom to do his work. I don’t think that’ll be part of her future studies. Speaking of studies, let’s examine the potential curriculum at the cold cave, and what kind of degree Arya might get at the House of Black and White. Just what are the young Starks going to learn at their versions of Westerosi Wizardry College, and how might their spooky skills influence the seasons to come? We know Bran’s a warg, meaning that he has an affinity for animals and can project his consciousness into them. At least into Summer, his direwolf. We’ve seen at least two other (non-Stark) wargs on the show, both Wildlings, so we have a sense of some things that wargs are good for. They can send their perception out across great distances for scouting/spying, using their animal vessel as eyes and ears. The Three Eyed Raven will probably be teaching Bran to do something other than just warging, but lets consider what advanced warging courses he might be taking. In my opinion, basic out-of-the-box warging is kind of limited. Bran had been warned by Meera Reed that spending too long a time inside Summer is risky, that he might forget he’s a boy and not come back to his own body. So the obvious improvement would be for Bran to warg into Summer, and not be in danger of losing himself so fast. I’ve always had the impression that the warg was limited in what they could do, based on the cognitive processes of the host animal. For example, Orell the Wildling had probably flown his eagle over Castle Black and saw that there were men there, but eagles probably aren’t awesome at counting. So he couldn’t call Jon’s bluff about the alleged thousand men at the castle. If Orell had been more “present” in the mind of the eagle (and Orell could actually count above ten, something I’m skeptical of…) things might not have gone well for Jon and his lying lies. But that doesn’t sound all that impressive. Would being a smarter lone wolf be worth a season off-screen, learning magic? One smart wolf might be cool but a pack of smart wolves, being directed in unison, would be much cooler. Maybe Bran will learn to warg into more than one creature simultaneously. We don’t have any direct evidence of multiple-warging on the show, but we’ve seen two instances that might be explained by that ability. 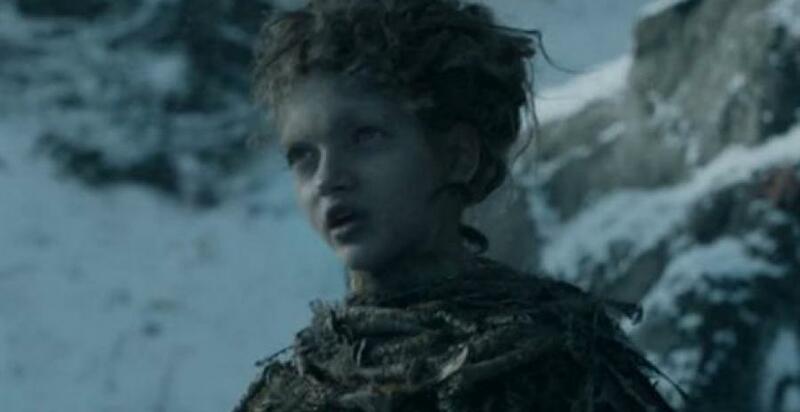 When Sam and Gilly were fleeing with her newborn son from Craster’s keep, they eventually are tracked down by one of the Others looking to retrieve the child. They’re given a heads up by a weirwood tree filled with crows, making a racket. We’re here for the feast, Fatty! 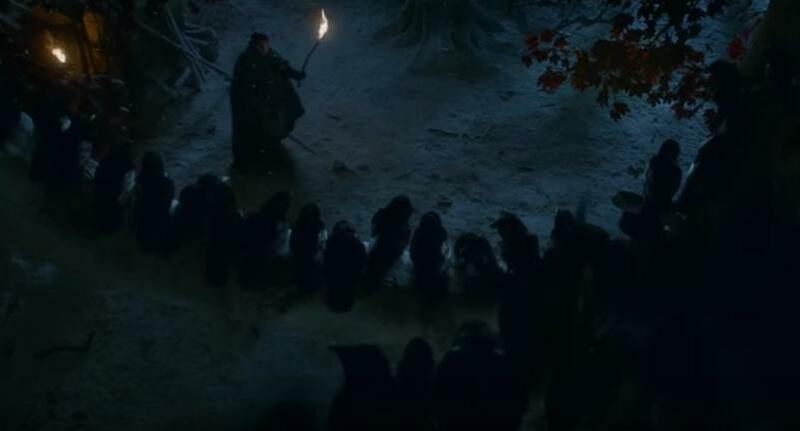 But Bran’s magical mentor is the Three Eyed Raven, and since he (or rather his elf) aided Bran against the murderous wights who lying about the impressive weirwood tree cave like a field of antipersonnel mines, I want to say that these crows were being warged into by the Three Eyed Raven to annoy and foil the White Walker’s baby acquisition plan. So… assuming Bran can warg and control a pack of direwolves perhaps, he’d have many eyes in play and lots of teeth to rip enemies to shreds. The second example of multiple-warging is a bit creepier. 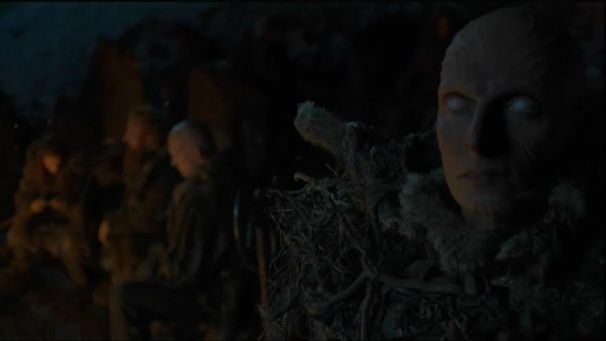 I’m convinced that the White Walkers are animating and controlling the dead in a fashion similar to warging. I don’t have any evidence for this, it just seemed like that’s the deal. Maybe a corpse is animated and it behaves the way all zombies do: attack the living! But we’ve seen sophisticated behavior from the wights. One of them remained dormant long enough to be taken into Castle Black, where he could shamble his way directly towards Lord Mormont’s sleeping chambers. That kind of implies an intelligence at work. 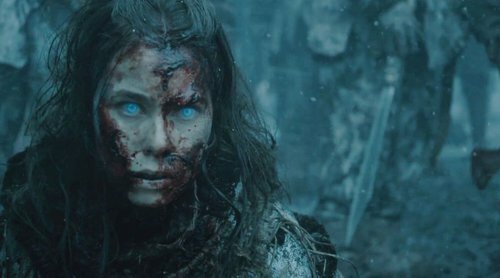 At Hardhome, the dead were dead. And then the Night’s King raised them up, and they obediently and single-focusedly looked out where he was looking, to the fleeing men in the rowboats. All by an act of unspoken control by the Night’s King. Until I hear otherwise, I’m calling it warging. Warging on a mass-scale. But even if it can’t be done across a whole bunch of wights, just being able to do one might be a cool warging trick for Bran. So, could Bran learn to control the dead? And maybe control a lot of the animated dead? Maybe not, it seems like a pretty creepy thing for young Bran to do. But it might be necessary for a certain someone killed to be up and about, filming scenes in Ireland. Jon Snow. But the scenario that gets most people excited is what the Three Eyed Raven told Bran at the end of Season Four. You will never walk again, but you will fly. I doubt Bran will literally fly as Super-Bran, but Tyrion Lannister once designed Bran a saddle so he’d ride as tall as any knight. But what if that saddle was on a dragon? With Bran controlling the scaly beast? Of course, if Bran can control the dragon warg style, he wouldn’t have to leave the cave. He’d be the dragon. NOOO! I AM THE DRAGON! So, depending on what the Three Eyed Raven wants to focus on, Bran might end up excelling at animal-control, or raising the dead, or raising an army of animals, or razing an army with a fire breathing animal. Scoring an invitation in the form of a special coin from cool-as-ice Jaqen H’ghar, Arya accepted an unpaid internship at the House of Black and White. As I mentioned before, The Faceless Men don’t seem to be explicitly running a school of magic, but assassins in fantasy stories might as well be wizards, right? In the books, there was more of a magical quality in how Jaqen arranged the deaths at Harrenhal than in the show, but in both versions of the story the Faceless Men were undeniably wielding inexplicable miraculous powers in the form of changing one’s appearance. This might seem pretty much like a one-trick pony, but they have more tools in their deadly utility belts. They definitely have some expertise in poison, something that often falls into the same category of magic. And their training and focus on being able to tell convincing lies and to detect lies tinges on the mystical. 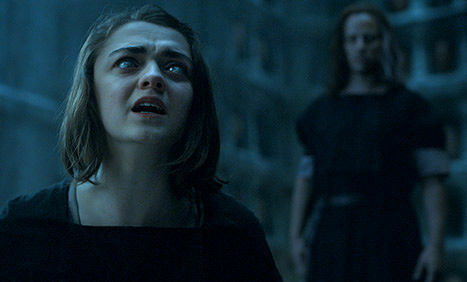 Just how was Arya struck blind? Until it gets explained otherwise, I’m voting magic. Assuming Arya gets her sight back, or just decides to learn to be an awesome blind warrior like Zatoichi or something (or if she gets unbelievably super senses to compensate, like Daredevil) what kind of wizardly shenanigans might she get into over in Westeros? This doesn’t necessarily set Arya up to be an army-eating machine like Bran might turn out to be. But it’s pretty clear that Arya could get to a point in her training where she’ll be able to get access to and to kill anyone. She’ll be her own one-woman death-spell. Don’t judge me, but my wife and I watch Once Upon a Time with our daughter. And if there’s anything I know about magic, it’s that it comes with a price. Because Rumplestiltskin says that line nearly ever single episode. I might say that, dearie. It sounds like something I’d say, sugar-bottom. We don’t know what price will be required for the magic that Bran will be trying to harness, and I’ve previously expressed my concerns of what this path might lead to. Along those lines, the gifts of the Faceless Men might require a price that pushes Arya down a darker path as well. Coming back to the Harry Potter analogy that I’m forcing, lets place Bran and Arya, our little wizards, into the classic Four Houses of Hogwarts: Gryffindor, Hufflepuff, Ravenclaw, and Slytherin. Gryffindor: Characterized by students who are brave. Bravery doesn’t necessarily equate with goodness, though. Hufflepuff: Eager to help. Hufflepuffs are enthusiastic and energetic. Should you have a bias against these guys, I’d like to direct you to this wonderful article about heroic Hufflepuffs. Ravenclaw: The smarties. They may not have Slytherin’s natural talent for magic, but they have the intellect to break down the principals of magic rationally, and approach magic logically. Slytherin: Yes, yes. The “evil” house. Or are they? Slytherin’s are characterized by ambition but more importantly often by a natural aptitude for magic, which might lead them to dismiss the other households as not “true” wizards. Remember, the heroes of the Harry Potter books could have fit into different houses. Harry himself could have been in Slytherin, because he was a natural at magic. Hermione certainly could have done well in Ravenclaw. And Ron… I think Ron was too lazy for Hufflepuff, not smart enough for Ravenclaw, and not gifted enough for Slytherin. So Gryffindor might be the slacker house. So what will the Sorting Hat say about the Stark children? House TARGARYEN! 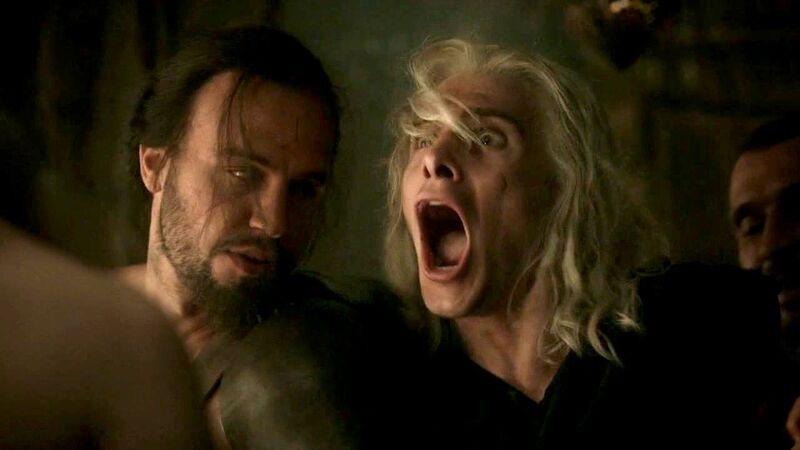 Everyone’s a secret Targaryen! Hmmm. Not so secret anymore, I suppose. Most images from HBO’s Game of Thrones (obviously.) 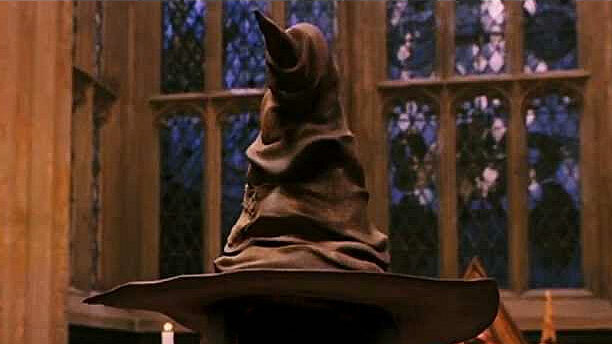 Picture of the Sorting Hat is from Harry Potter and the Sorcerer’s Stone. 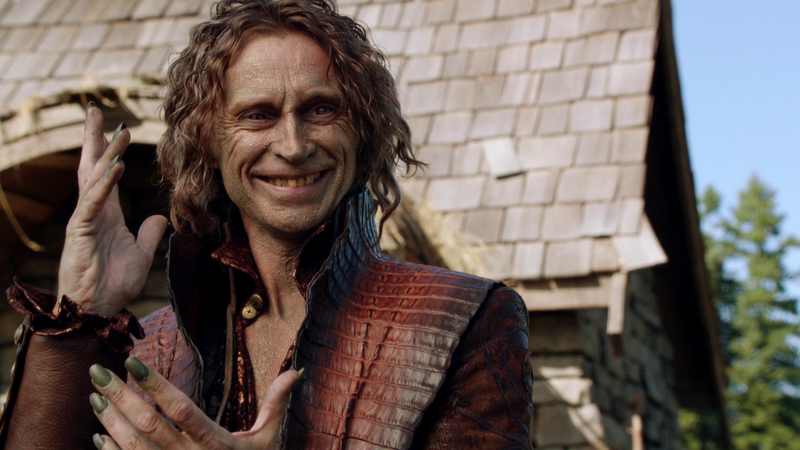 Image of Rumplestiltskin is from the ABC show Once Upon a Time. Poisons fall under Potions, Prof Snape’s initial area. Go Hufflepuffs! I assume that I’m one. too! Thanks for mentioning potions, which is clearly a magical field of study. Great post, loved Potter analogies. I don’t see why anyone would think they were tenuous links! Personally, I think Arya is heading towards Slytherin – she’s quick witted and cunning, plus swamped in anger by the grief the world has bestowed upon her. She having an Anakin moment! I certainly hope you’re not right about Bran animating Jon’s body. I don’t know which will be worse – Boring Bran making the Lord Commander’s choices or Jon being used as Melisandre’s plaything. Both make me feel uncomfortable! That said, Bran deserves something spectacular to pay off for the seasons of dreariness (can you tell I’m not a fan?) just like the stoic Hufflepuffs. Sam Tarly’s a Huffler too, I’m sure of it. On the subject of warging, could you just clarify something please? I’ve started having issues with the popular notion that Jon has warged into Ghost. If your own body dies, won’t you be trapped forever in what you warged into? Isn’t that one of the reasons Bran is told to eat human food and not keep running off hunting because HIS body can’t survive on mere wolf kills? It’s only as I’ve got further in the books that I’ve thought this is going to be problematic! Here’s the warging deal, you pretty much have it right. Someone who has the warging power, on death, has the ability to escape death by fleeing into their animal. And then they’re that animal. Until they die. It’s called the Second Life. I also don’t want Jon being warged into Ghost. Unless they can get him back out and into his wild-haired normal body. Ah, well thank you for the explanation! What happens the other way around, i.e. If the animal you’re currently inhabiting gets killed? Instant death or just snap back to your ‘real’ self? I don’t know if there is an example of that, but I assume snap-back. Hey, I also want to thank you for talking about how you voted and your reasoning. It’s fun to hear these opinions! You’re welcome, I’m always a sucker for fictional crossovers (watched first Agent Carter tonight and I’m now inventing ones that aren’t there!). So sorry I’m not a Bran Fan though, at least I can say I read his chapters – a friend of ours has skipped most of them! 🙂 It’s okay. I’m magnanimous enough to forgive you for your lack of Bran love. KIDDING! You’re the best, regardless. Your friend is a clown though. A CLOWN!!!!! They met Hayley Atwell??? I am very jealous, think she’s great although I secretly just want Peggy’s wardrobe! They did. She came to a convention in Philadelphia. 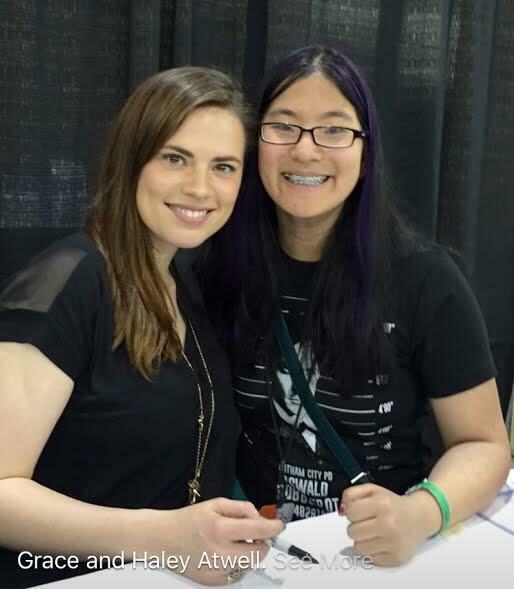 I waited in line for about an hour with my daughter so she could get an autograph, but I let my wife swap out with me once we got near Atwell. Since of the two parents, it’s best my wife be the one who escorts her to the celebrity. Oh, the link won’t let me see it, unfortunately, says I’m forbidden!! Hmmm. I will tweet it to you. Sorry about that. No worries, it may have been because I was viewing it on my phone – technology generally hates me! I thought Arya was more a Slytherin as she seems all dark side, what with her kill list and all. She’s so cold! (Don’t get me wrong, I love her, she’s a survivor.) Bran strikes me as a Gryffindor because he’s so brave, God love him, and he seems more noble. He’s trying to survive and the warging thing is just part of that, plus he’s teamed up with earnest, well-meaning types. 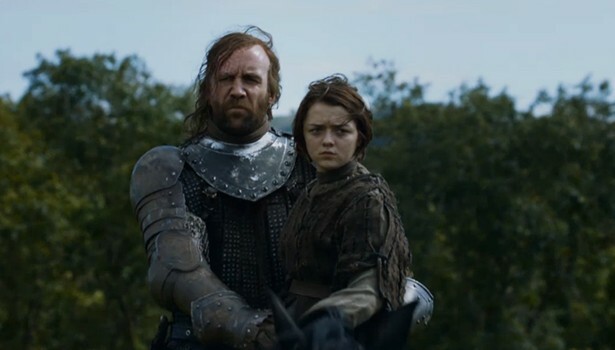 Arya’s been hanging with the Hound. That has to affect your judgment, no? Lea, thanks for voting and talking about your process. I’m not going to argue with you. I will defend Slytherin as a household, because evil isn’t a prerequisite, but it kind of goes hand in hand with ambition and the entitlement of natural aptitude. But Arya might be a natural for assassination stuff (even if she’s not particularly ambitious… but I just might not be seeing her ambition at work) and that might qualify her as Slytherin, as well as her fearlessness might nominate her as Gryffindor. I’m a big fan of Bran – I just am! – and so it pleases me that you have him as a Gryff. I kind of imagine him as a Hufflepuff… but since he’s also naturally gifted with warging and he does act occasionally snooty … he might be a secret Slytherin. You’re certainly right about their companions, and I do think that’s a big influence. As usual, I can’t read anything but I know it’s good. It’s like a lovely box of chocolates that I can’t open! Awww, thank you! I look forward to the day when you get caught up on the show, and you can read my essays. Until then, I appreciate your votes of confidence!